There are many types of braces available these days but traditional metal braces are still what most people think of when they picture braces. Our BC orthodontists talk a little about these classic orthodontic appliances. 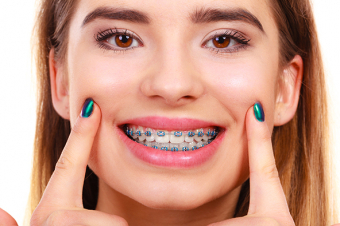 In spite of a growing variety of orthodontic treatment options available, traditional metal braces are still the most commonly used devices for straightening teeth. That said, it's important to note that metal braces have changed a lot over the years. Today’s metal braces are much smaller, lower profile, and more comfortable than previous versions. Unsurprisingly, metal braces are made of – you guessed it – metal! Typically, they’re made of titanium or high-quality stainless steel. The brackets are the part of the braces that are attached to the teeth. The brackets are held in place thanks to a special bonding material applied by your othodontist. The brackets are attached to each other by the archwire. The archwire's function is to put pressure on the teeth to guide them into their new positions. Ligature elastics are the colored (or clear) ties that hold the archwires to the brackets. Your orthodontist will change the elastics at each appointment, giving you the opportunity to change the colours each time. Braces exert continuous pressure on your teeth, and the force of this pressure is what moves them into the correct positions. Each time you visit your orthodontist during treatment, they will likely tighten the archwires and replace your ligature elastics. These steps are important for keeping your treatment progressing as planned. Are Traditional Metal Braces for You? Traditional metal braces continue to be among the most popular and most cost-effective orthodontic treatments available today. However, it's important to remember that each patient is different. Your orthodontist can help you determine which treatment is best for your individual case. Please contact the BC Orthodontics Group Practice near you to schedule an appointment and learn more about how braces can enhance your smile.